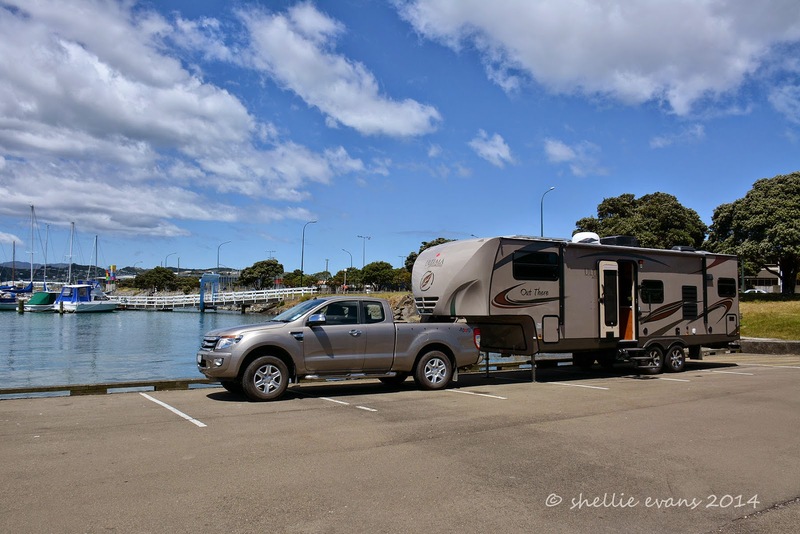 Well, we’ve come full circle, we’re parked up on the front row beside the Mount boardwalk on exactly the same site as we had 14 months ago when we began our new life on the road. Many of the sites behind us and overlooking the beach are closed; concrete pads and new grass have been laid and this is putting pressure on the remaining sites. I can see there’s going to be a constant stream of ever changing neighbours over the next three weeks. At the moment we have three families in tents on one side of us, they have nine children under 5 between them. Brave people! Brave us! I had to laugh this morning when two of the Dads came back with takeaway coffees and hid behind the tent (which happened to be beside our dining window) while a kid was screaming on the other side. I suspect one of them would have been called on, had he shown his face. Another cruise ship arrived this morning, I saw her on the horizon as I left the van for my morning walk. I knew she wasn’t far away when the tugs passed me on their way out to assist her through the entrance. I waited down on the sand near Stoney Point for her to pass through, it never fails to impress me how big the ships are as they come through the very narrow entrance. 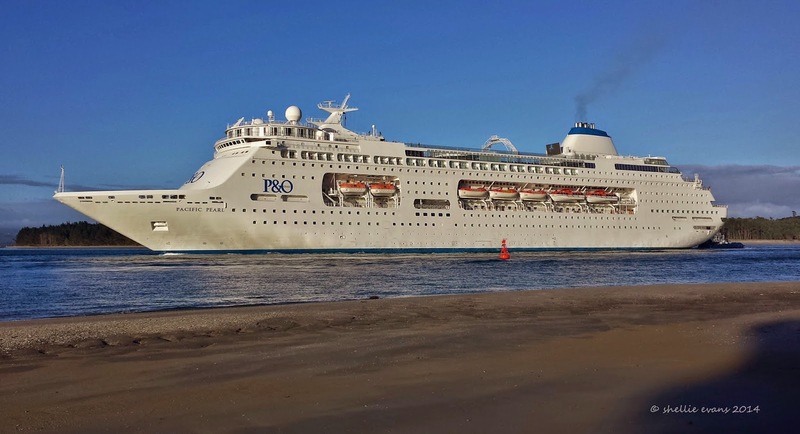 And the Pacific Pearl is far from the biggest cruise ship to visit the port. 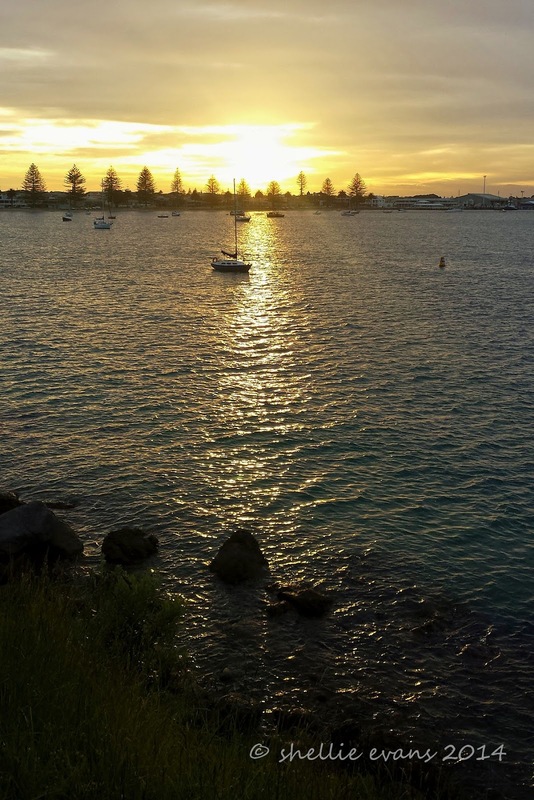 Tangaroa, Maori God of the sea, performs a wero, or challenge, to those entering the Tauranga Harbour. I wonder how many locals know that Tangaroa used to face into the harbour. He was commissioned in 1976 to commemorate the centenary of the Port of Tauranga but was turned around in 2007 to face incoming vessels as this was the correct stance to challenge new arrivals. 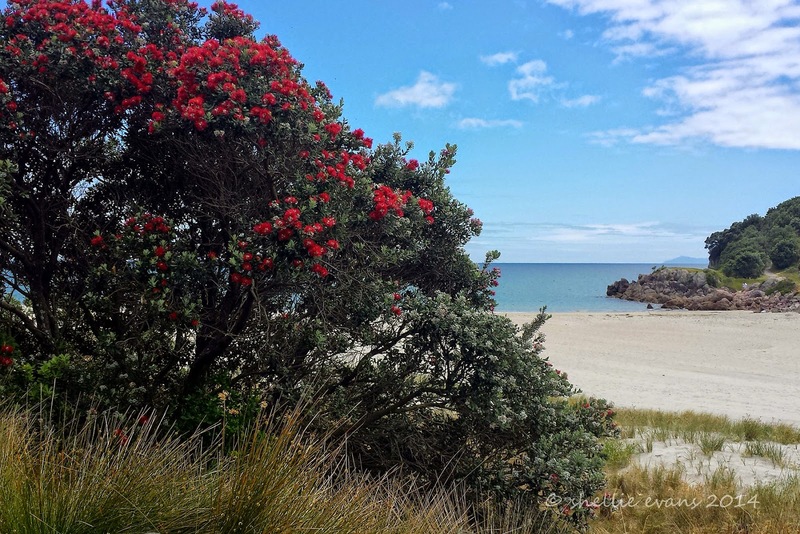 Along the beach the pohutukawa (NZ Christmas tree) are finally starting to bloom but there’s still only a hint of crimson from the hundreds of trees over the Mount. According to folklore, an early bloom means a long, hot summer and we’ve certainly had some lovely days this past week; warm and very humid overnight. Although today there’s a cool breeze blowing. 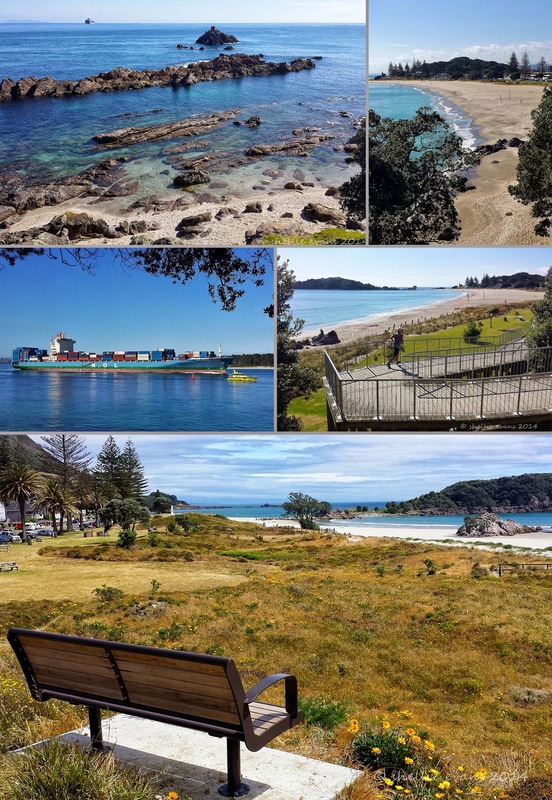 Tauranga City Council & the Dune Protection people have been hard at work while we’ve been away; restoration work, planting of sand tussock and other native grasses and fencing of the sand dunes along the Main & Ocean Beaches has been completed and it's all looking very good. 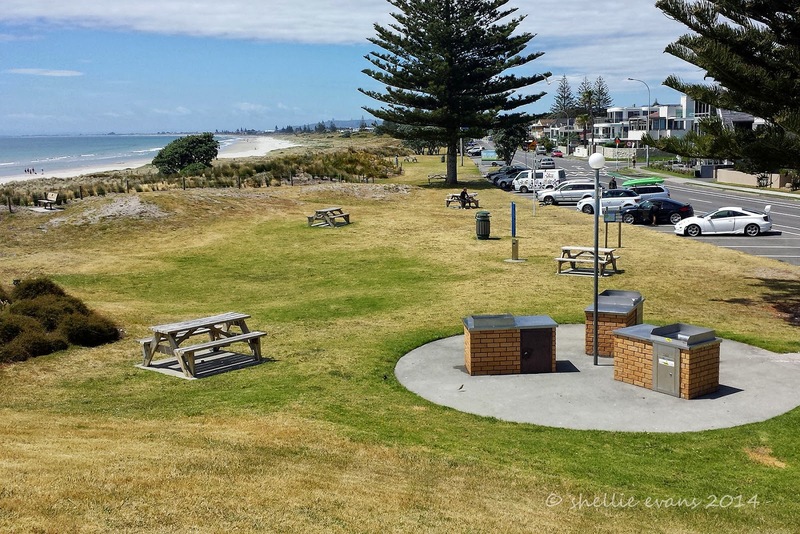 There are plenty of well marked walkways and sand ladders down to the beach and picnic tables, seats and gas BBQs (free to use) have been upgraded or added at various spots. The controversial boardwalk along Pilot Bay has also been completed and looks like it's always been there. It’s much easier to negotiate from one end to the other with a defined walkway as you’re not stepping over or around sunbathers, kayaks, sail boards or picnicking families (obviously not a problem in this shot) or across uneven ground. 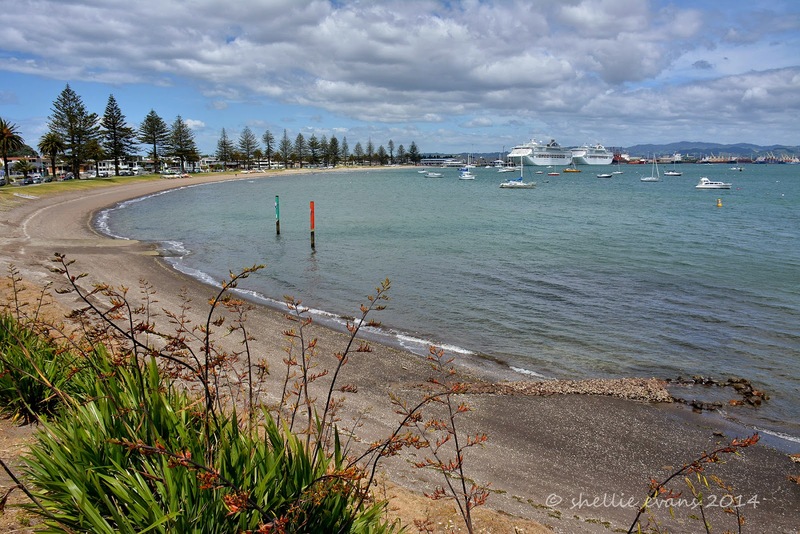 It's great for visiting cruise ship passengers as it leads the way down to the Mount Base Track and is a continuation of the Main Beach boardwalk theme. 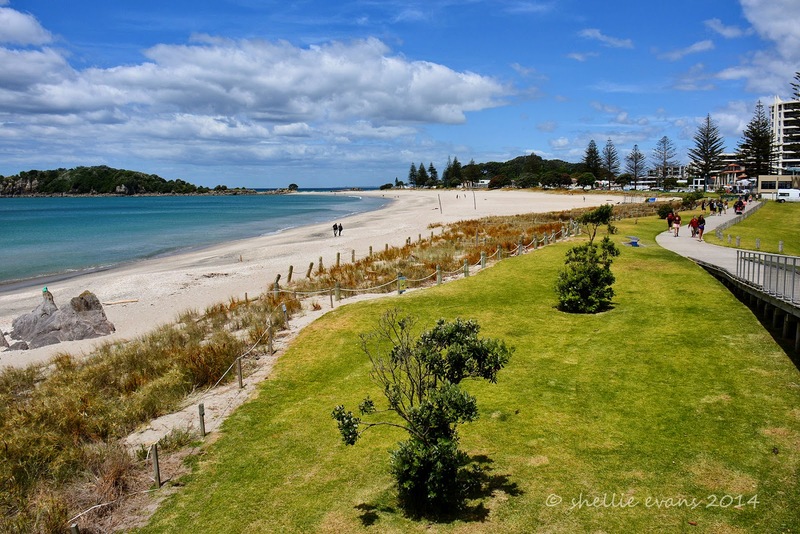 Mt Maunganui is definitely looking very smart & sleek and is well geared up for the summer influx of visitors. A proper little resort town. 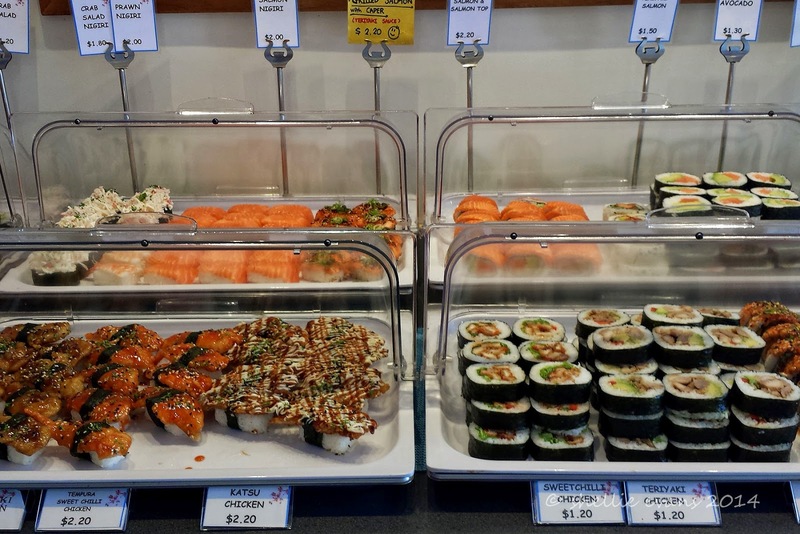 I’m in seventh heaven, I’ve found myself a seriously good sushi restaurant in downtown Mt Maunganui. 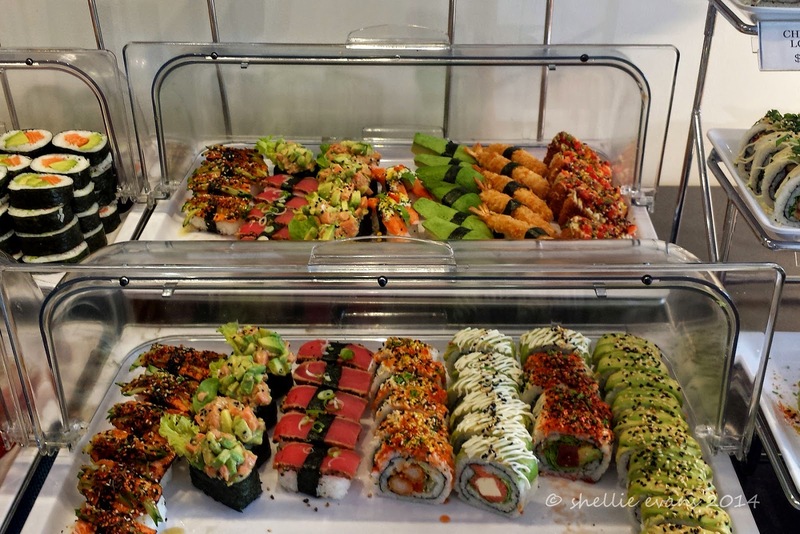 I love sushi, I could eat sushi morning, noon & night and still want for more. 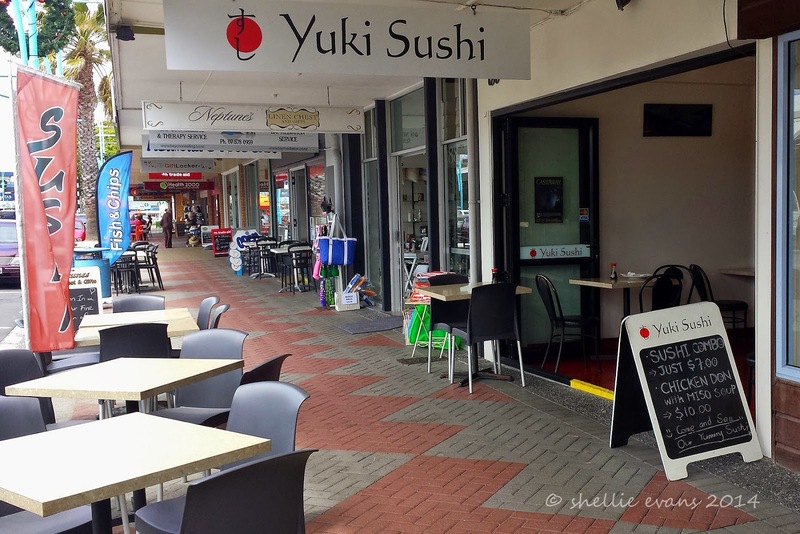 And with at least four sushi bars dotted along the short and busy Mount Mainstreet I’ve had plenty to choose from but this little restaurant, Yuki Sushi, wins hands down. Except of course, when I add a selection of deep fried items to the plate. It's called research. Very fresh and extremely delicious, the prices are also very reasonable. And with so many different varieties to sample, my lunches are taken care of for the next three weeks! Yuki Sushi- there's some irony in that name if you don't know how to pronouce it. I’ve joined the ranks of the paparazzi and a sneaky one at that- mind you aren’t they all sneaky? We’ve shifted across the road from the campground to the Oceanside Towers while our van has some work done on it. We’re not in the Towers but in the hotel part of the complex and look who checked into the rooms below us on the same day. Our balcony overlooks theirs & everyday there has been a constant stream of buff bodies and impressive tats passing below as they head off to training or for a swim at the beach. Of course I just happened to be nonchalantly sipping a wine on the deck when they passed by- luckily with my cellphone at hand. Don't ask for names, I have absolutely no idea! 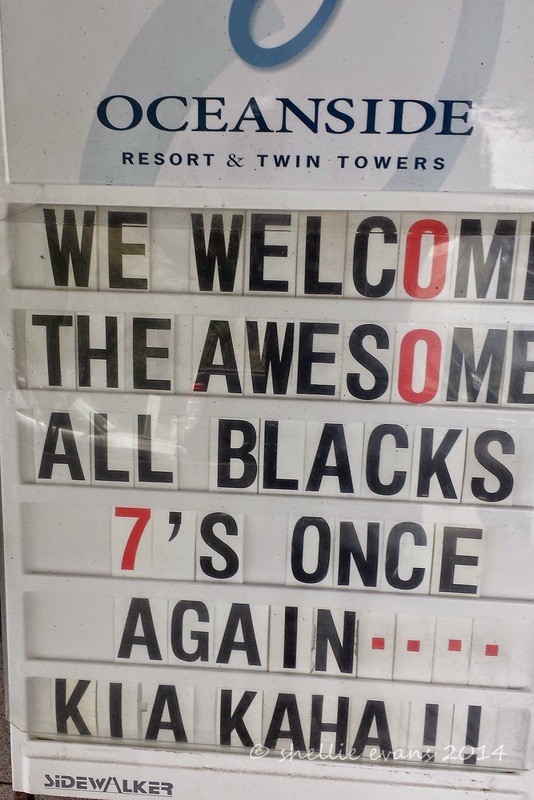 Sevens is the fast-paced, shortened form of rugby played by seven aside teams and the All Blacks Sevens are the masters of the format. They are head and shoulders the most successful national sevens team in the world, competing regularly on the IRB World Sevens Series circuit around the world, which it has won ten times. The team also won the Rugby World Cup Sevens title in 2001 and four Commonwealth Games gold medals. They will be competing for gold at the Olympics in Rio De Janeiro in 2016 when rugby sevens debuts on the Olympic stage. ….you might remember me, I wrote to you a few years ago when I slipped down your central city parking building stairway and broke my ankle. I was bedridden for 6 weeks over Christmas & New Year. You very kindly (after a serious prodding by my devoted husband) enquired after my health & sent me a bouquet of flowers which was personally delivered by one of your managers (I was expecting nothing less than the key to the city). And then you renewed the non-slip edges on every step in that stairwell and attaching warning signs to the wall on all the landings advising to be cautious if the stairs were wet. Well I write to you again, to complain about the very fine gravel that is spread over the Mount Base Track. I know it’s been there for awhile and in some places it’s gone altogether and I know its there because if it wasn’t and its wet everybody would be slipping and sliding along on the clay base. Instead it’s just me slipping and sliding. I know I’m a klutz and I’m sure it’s just a coincidence that I write this letter not only in the same month but in the same week that I wrote my last one. 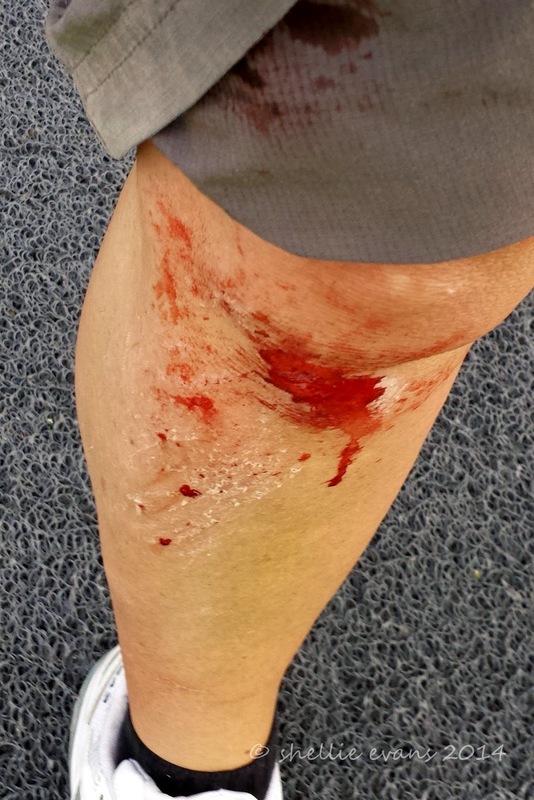 Thankfully I didn’t break an ankle this time but boy I came close; I felt it twinge & stretch. Not only do I have a large gravel rash on my leg but there’s one on my palm too and my phone needs a new protective cover as well. Serendipity I’d say, had I had my camera....it doesn't bear thinking about. The day started out well; out the door at 5:45am just in time to catch a fiery sunrise…..
….past Pilot Bay as the sun made a short appearance before disappearing behind the clouds…. Sunday morning & the track to myself, the only other sign of life, boats heading out the entrance taking fishers to their favourite spots out on the briny. It’s good to be alive! Cool and damp and going well. I think I might do two circuits this morning. A moment of reflection at this beautiful little shell beach where many generations of children have played and families have picnicked over the years and sadly where a little boy, Jack aged 5, was swept away by a rogue wave recently. His body has yet to be found. 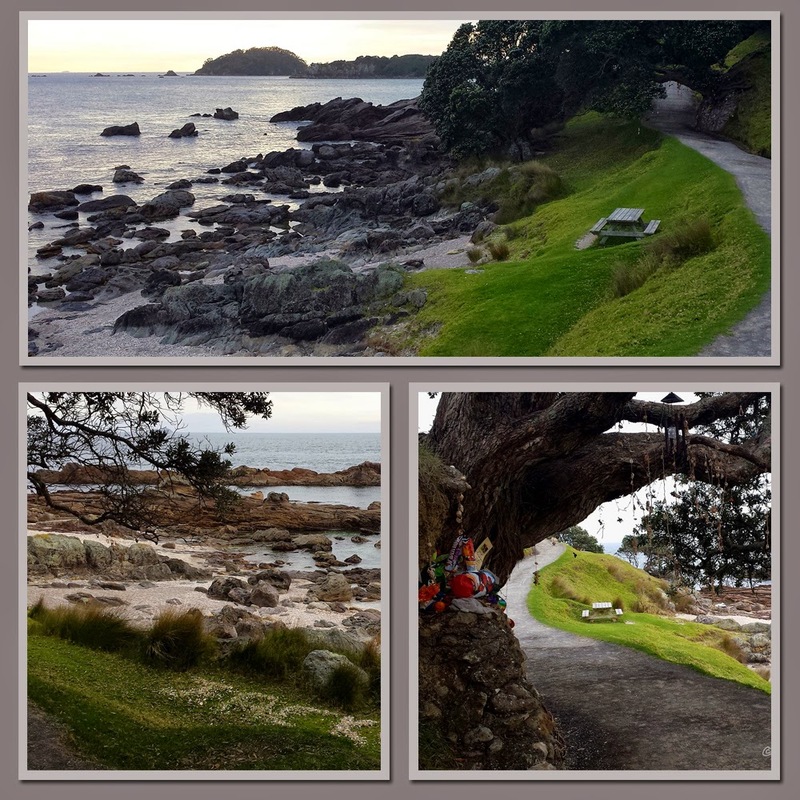 The huge old pohutukawa tree that overhangs the track near the beach has become a shrine & memorial to Jack, the low hanging branches are covered in hanging shell chimes and toys, photos & messages are tucked into an area by the trunk. So sad. 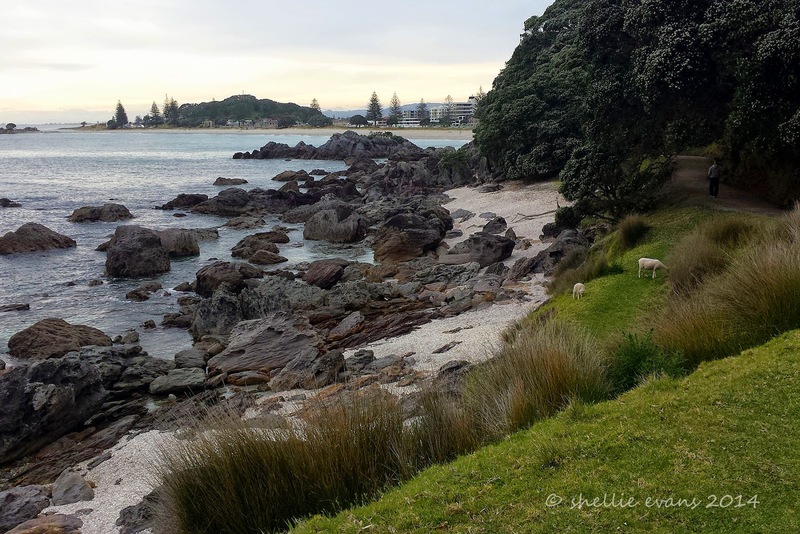 Mt Maunganui is a pretty special place, where else in New Zealand can you climb an extinct volcano cone or walk around its base, see sheep grazing beside the surf just a few short steps from one of the most beautiful sand beaches in the country and have a thriving and busy resort town that is always in holiday mode on your doorstep. It was about here that I was heading for a fall. After taking a photo of the main beach in the early morning calm I stepped away..... and well, the rest, as they say, is history. Yikes! It feels like my right arm has been cut off. My faithful Nikon camera that never leaves my side and is used nearly every day has been sent away for a well deserved service. Along with my most used lens (18-300mm) which requires the zoom rubber on the outside of the barrel to be replaced. A rubber that has stretched considerably because of the constant zooming in and out. I’ve not been looking forward to sending my camera away because, depending on what is required, it can take 2-3 weeks before it will be returned. Of course they won’t give any indication of a time frame, just it’ll take as long as it takes. 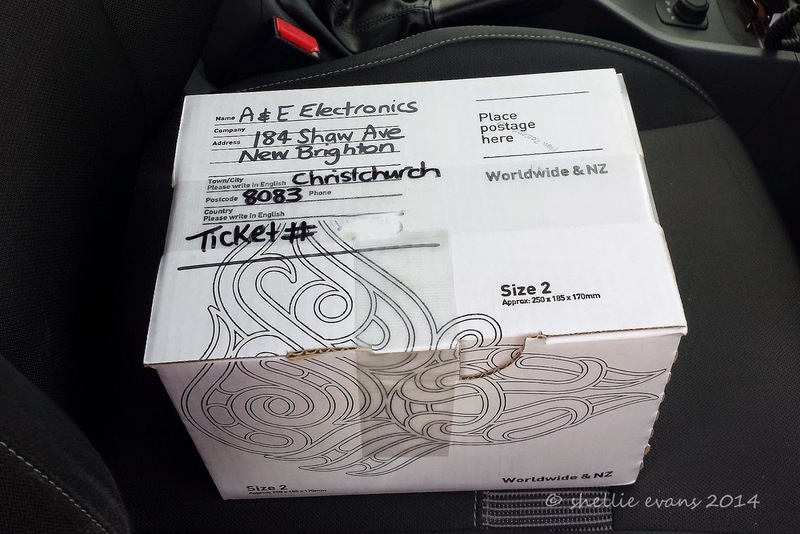 I have my fingers crossed for a quick return- not only because I need my camera but because a quick return should mean a less expensive bill! I hope. So for the foreseeable future, my blog post photos are going to have to be taken with my phone’s camera. That should be fun. Not. I was interested to see how many ‘clicks’ I’ve taken with my Nikon. I had bookmarked a website- myshuttercount- which I’ve used before, where you upload the last photo taken and the programme reads the metadata to give you the actual shutter count of the camera. So, I’ve had this camera for 15 months now, I wonder if you can guess how many photos I’ve taken during that time? 30,000? You & David think alike. But you’re still so wrong. 40,000? I wish- that would mean that I would have had a lot less post processing & deleting to do. 50,000? Really? You think I took that many photos, shame on you! Yeah I know, blew me away too! 60,000 photos = 4,000 per month = 131 photos per day! But haven’t you enjoyed them! I really need to learn to limit my clicks, it would save me one hell of a lot of work. But to be fair a lot of these are when I’m trailing different techniques, learning different settings……and taking nearly 10 of everything ‘just incase’. After a very wet night in Marton, the next morning dawned cold and extremely windy. A few in the camp who were due to leave decided to stay on as they didn’t want to venture out into the gales. We decided we’d be OK- and we were keen to keep moving- we’d take our time and see how we went. 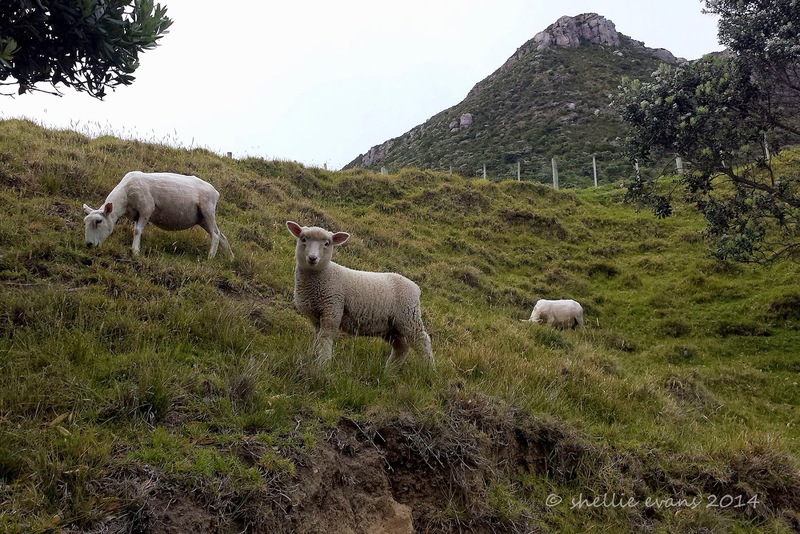 We were buffeted about quite a bit especially for the first 20 kms or so across the flat farmland but once we got into the hills it eased off a little. 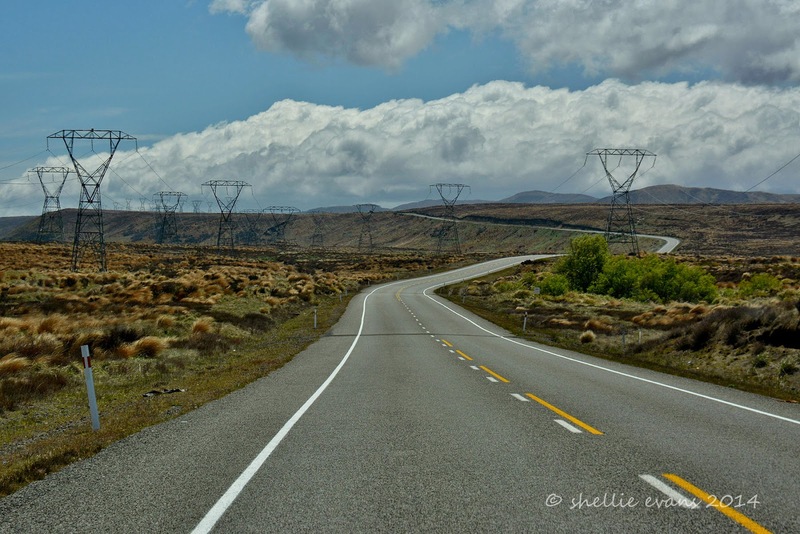 Then just south of Waiouru it became gale force again pushing us sideways with every violent gust especially as we crossed the Desert Road. Everybody we passed looked to be holding tight to their steering wheels and concentrating on the road ahead. What would a road trip be without pylons marching along with us! 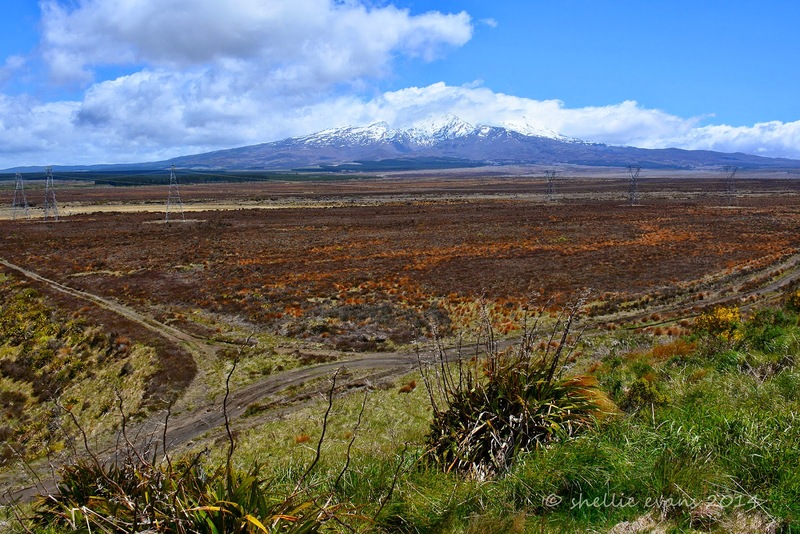 We were going to stop for lunch at one of the rest areas overlooking Mt Ruapehu but decided against it when we pulled in for a loo break (have I told you, towing your loo behind you, is one of the major benefits of living on the road). The door was wrenched out of my hands and slammed against van with such a force I was sure the door window was going to have a crack through it. The van bucked and rolled with every gust- not so great when you're sitting on the loo- so as quick as we could we got moving again, stopping beside a stream further on, in what was about the only dip in the road and well protected from the wind. 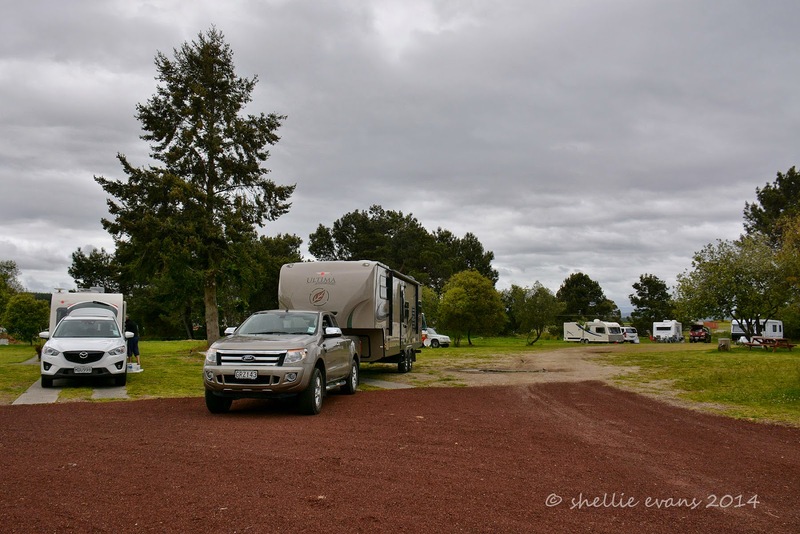 It was with some relief when we finally pulled into the NZMCA Taupo Park near the airport. David felt his arms were dropping off from gripping the steering wheel so hard and fighting the gusts. Once again, like Marton, there were quite a number of vans in the park. We’re trying to get used to having more company than we’re used to down South. And we were a little disappointed that we couldn’t park in our regular spot- the west end of the park has been fenced off. I assume to let the grass recover before the summer influx. Oh well it was only for a night so we backed in under the tall tree remembering just in time to check the satellite reception , then having to pull forward a metre or so until we cleared the branches. Aside from the busy parks there’s also been the busy roads to get used to, traffic everywhere and everybody going about their business without, what seems, any thought for others. 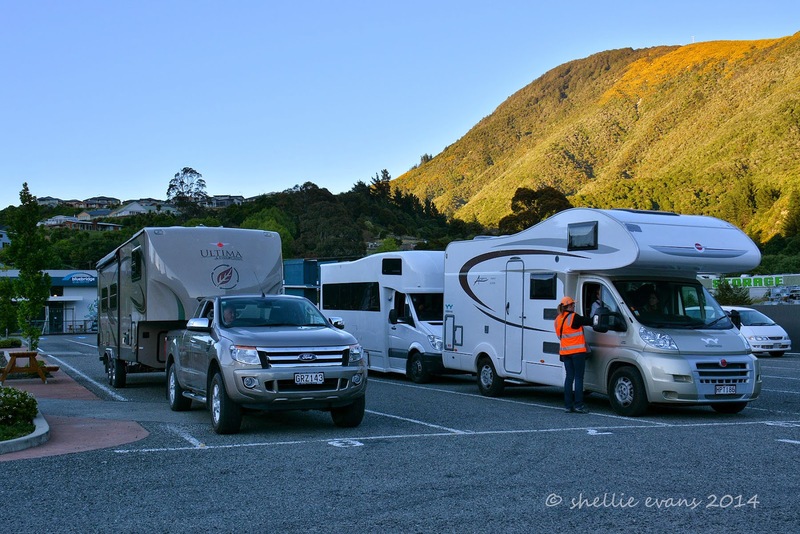 Almost immediately we noticed there were no toots to thank us for pulling over to let people pass, unlike the South Island where 95% of people will toot to thank you. And there were so many cop cars on the road- obviously needed going by how many cars pass on double yellow lines. I think we might have seen about six police cars in all our time down South whereas there were at least eight on the road between Marton & Taupo. 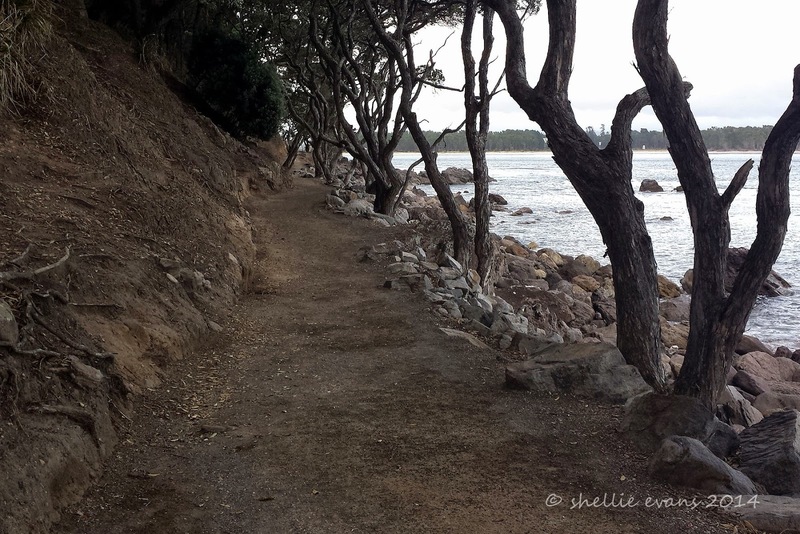 We’re staying at the Mount campground once again, it’s nice and convenient and has the beach & Pilot Bay for walking, along with the tracks over and around the Mount. The 5th-wheeler is booked in for a full service & a few extras early next week so we’ll shift over to the Harbourside apartments for a few days (we won't know what to do with the space!) 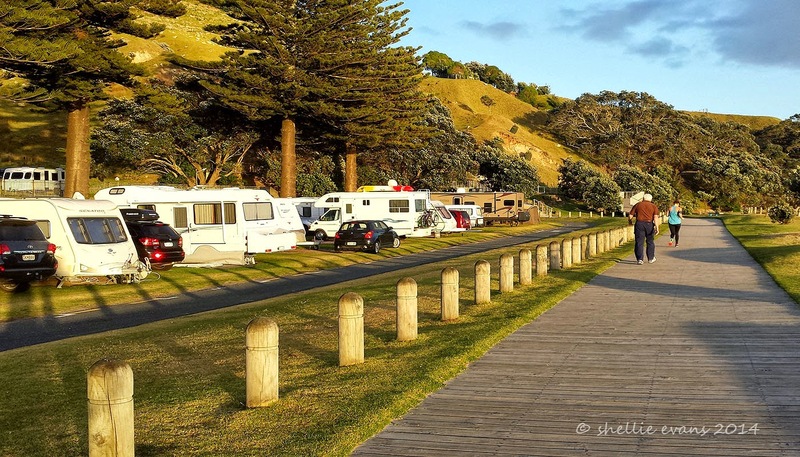 and then back to the campground for another few weeks before we head to Napier for Christmas. 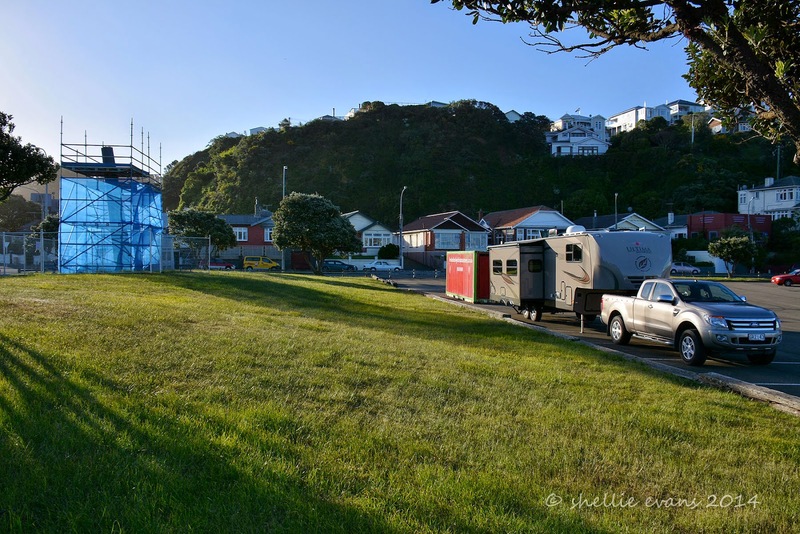 Unfortunately our usual site on the beach front is unavailable until we come back next week so we’ve taken a site in the Harbourside area near Pilot Bay. Unfortunately so have 100 kids on a school camp; their tents are all pitched below us with a marquee just below our kitchen window. So far they’ve been fine although there was a bit of hi-jinks going on until late last night. Someone must have sorted it out because suddenly all screeching and laughter stopped dead at 10:45pm. Not only is the campground busy but we woke up this morning to a passing parade of white sandshoes (sneakers), ten gallon hats, bum bags (fanny packs) and loud jackets. 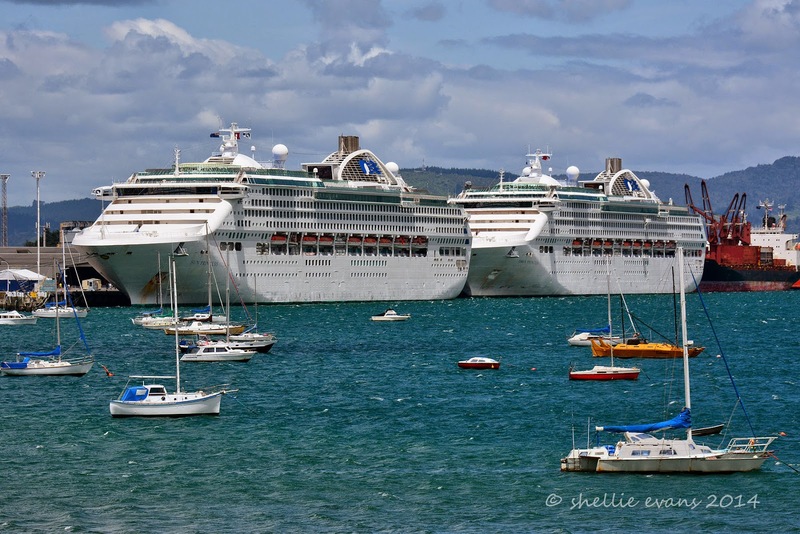 Two of the biggest cruise ships that ply the waters around New Zealand, sister ships Dawn Princess & Sun Princess had arrived in port early this morning. 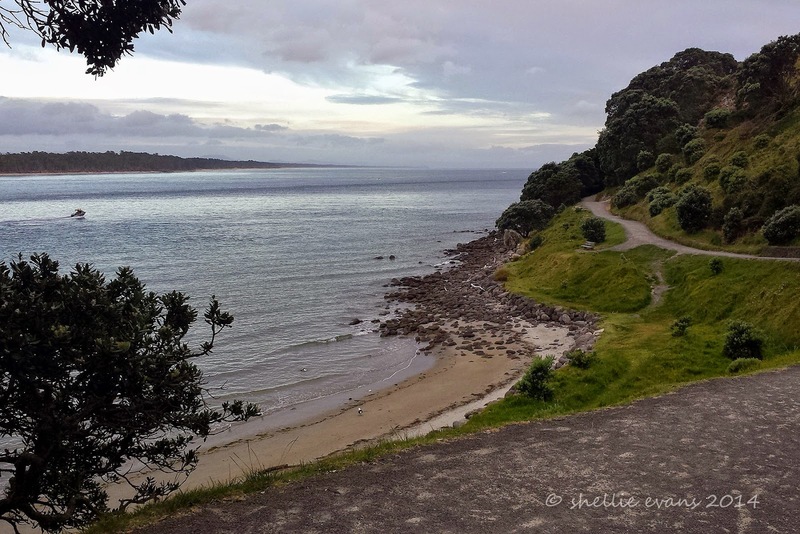 Guests who hadn't taken tour buses over to Rotorua were either walking around the Mount or along the beach boardwalk or shopping in town. 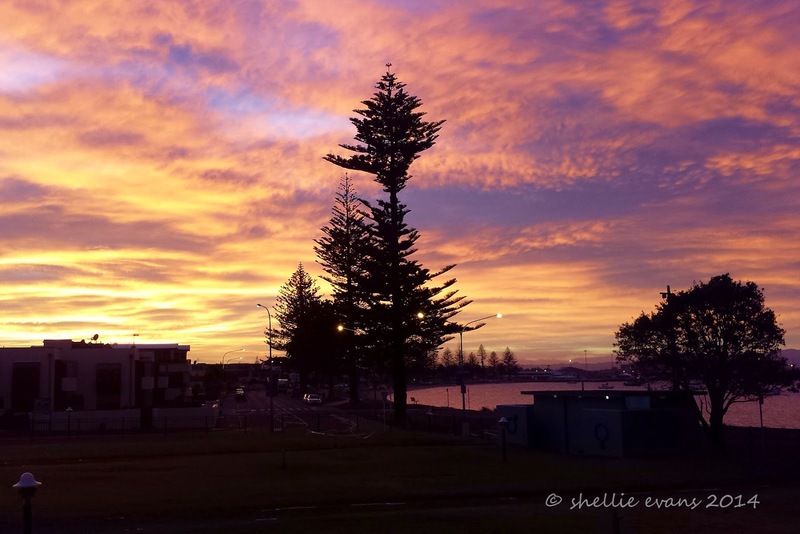 Mt Maunganui is certainly bursting at the seams. 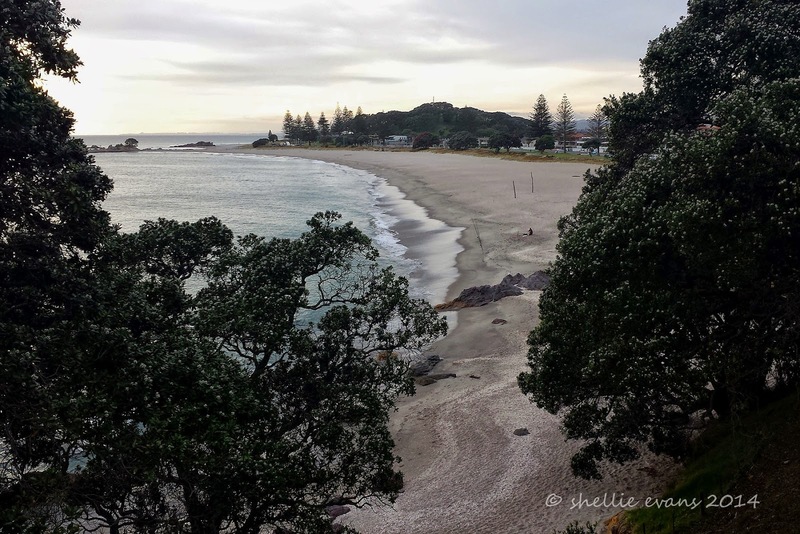 It is good to be back at the Main Beach and having Mt Maunganui on our doorstep again. I have missed walking the base track and first thing this morning I was off and around it, meeting two people I knew before I had got more than half way. I’m looking forward to walking to the top when this wind drops and the sun comes out for more than an hour or so. And hopefully the pohutukawa trees will burst into flower before we leave, everywhere the trees are smothered in buds with a hint of red showing. I missed the flowering last year and there aren’t any pohutukawas down south. There is plenty of flax down south though and lots of flax around the mountain and campground with dozens of flower spikes ready to break open. A feast awaits the nectar feeding birds. One thing that surprised me when I saw the Main Beach was how white the sand was. It’s funny how you tend to take things for granted when you see them everyday. There was lovely white sand on some of the South Island beaches so it’s not like I haven’t seen white before. For some reason the Main Beach just looked very white yesterday. It is great to be back and I’m sure we’ll settle down for the few weeks we’re here but we both commented after seeing the family yesterday, that we were good to go! As predicted we were first in line at Picton’s Bluebridge ferry terminal, which actually wasn’t hard as there were 8 lines. We arrived there just after 6am, & in fact were the 4th in line at the drive through check in booth, on a what looked to be, a perfect day for sailing! The lady with the hi-vis jacket is from bio-security, checking all vehicles for items- fishing, boating & tramping gear- that may have had contact with water from the lakes & rivers around the South Island. Checking for didymo, commonly known as ‘rock snot’, the introduced, very evasive aquatic algae pest that is choking the pristine waters of the South Island. 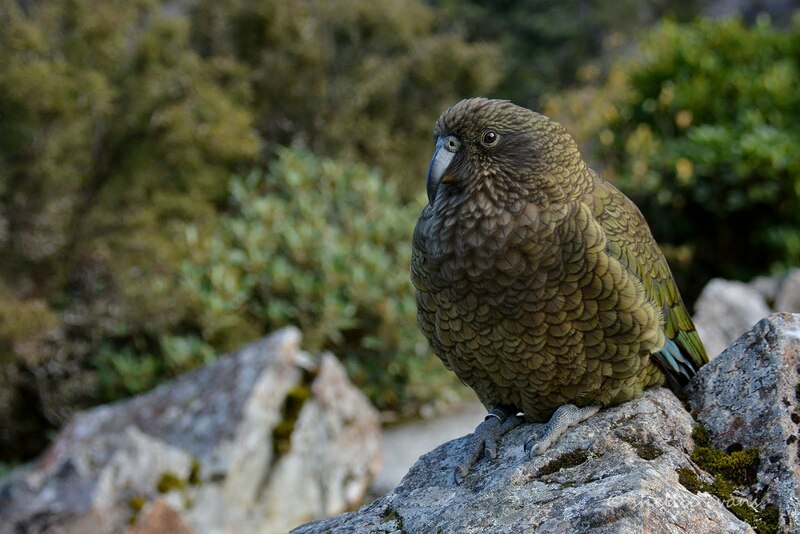 It has not been transferred to the North Island. Yet. Unfortunately I think it’s only a matter of time though. All gear must be cleaned with detergent or a bleach solution to kill the spores. Our boots & fishing gear had been cleaned in soapy water thanks to David’s meticulous ways but we must wash the boat down again, and the outboard, when we next inflate it. The warm sun finally reached us as we waited in line, David enjoying a chat with an American guy & his daughter in the motorhome next door. They were keen to talk about the 5th-wheeler and their time in NZ. 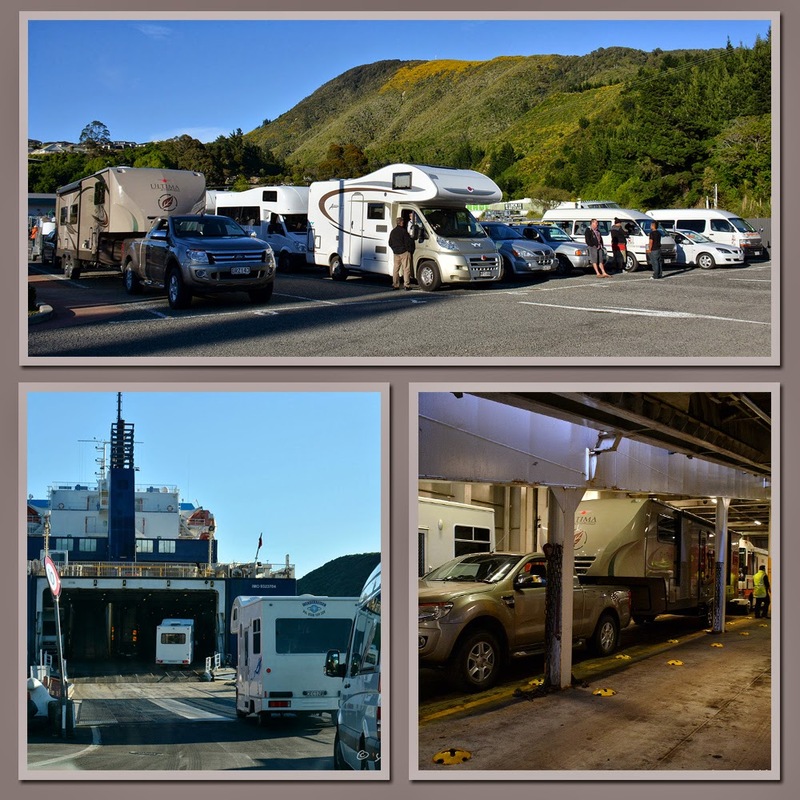 Before long and without any fuss we were loaded and ready to roll, it was a quiet day compared with our crossing 13 months ago when one of the opposition's ships had been out of service for weeks putting pressure on all Cook Strait crossings. 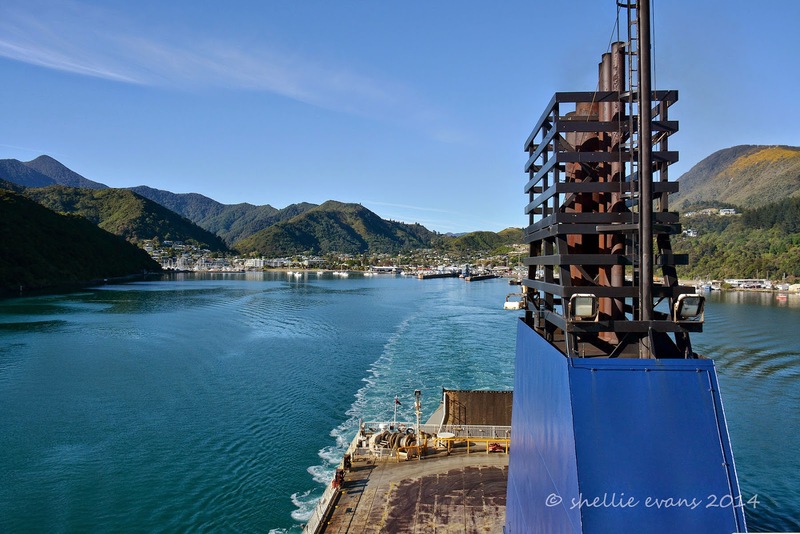 We pulled out of Picton, feeling a little sad that we were leaving the South Island behind but looking forward to catching up with family & friends in the North Island after 13 months away. And at least we know we will be back to finish exploring in the new year. 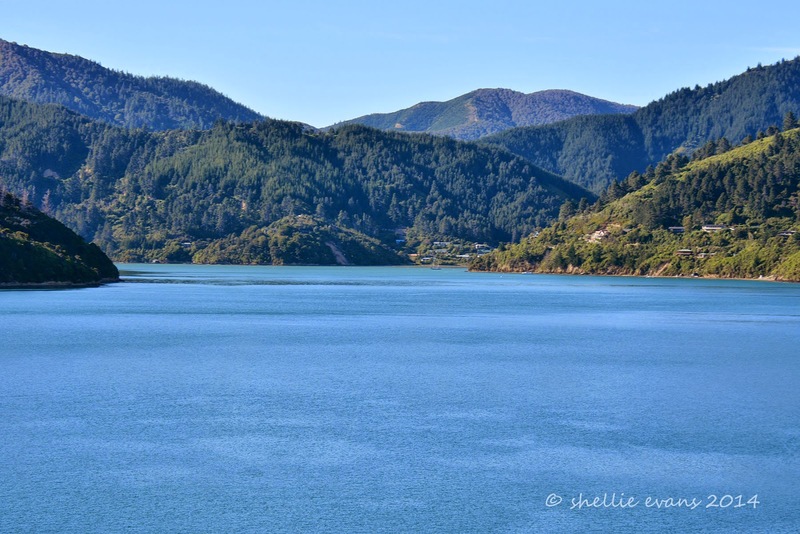 Queen Charlotte Sound looked picture perfect on this early morning spring day. I was just happy the ferocious winds of yesterday had gone. Up on the top deck this whanau (family) were having a feast, a large pile of crayfish bodies wrapped in newspaper- their version of fish ‘n chips, without the fish or the chips! Overseas tourists looked on with mouths dropped in amazement- one lady told another that she’d bought a crayfish half the size for $80 in Kaikoura and here these people were feasting on at least 8 crayfish. I didn’t like to tell them that the tails, where all the meat is, were gone, they just had the bodies & legs where arguably the tastier meat is, but it does involve a little more work in getting to it. Now that we’ve travelled around the Sounds, viewing where we’ve been from the water takes on a whole new meaning. 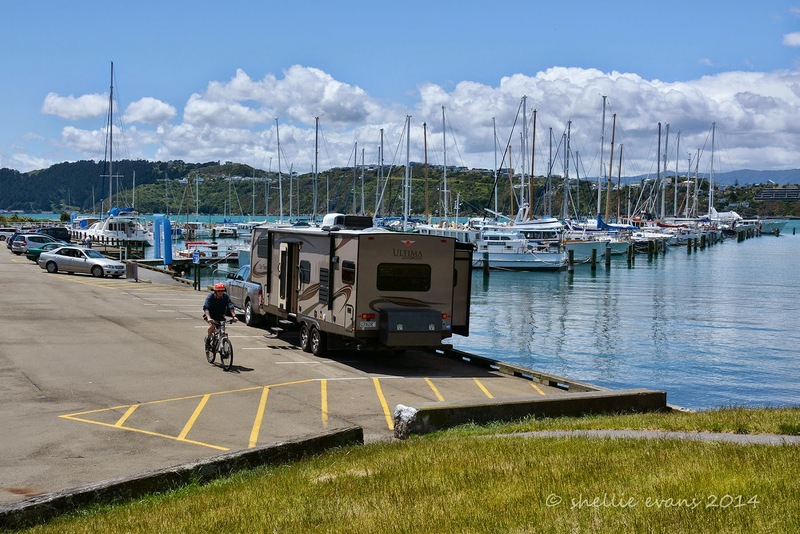 We pass Waikawa Bay Marina, just around the point from Picton and where we stayed in the holiday park for the last two nights. 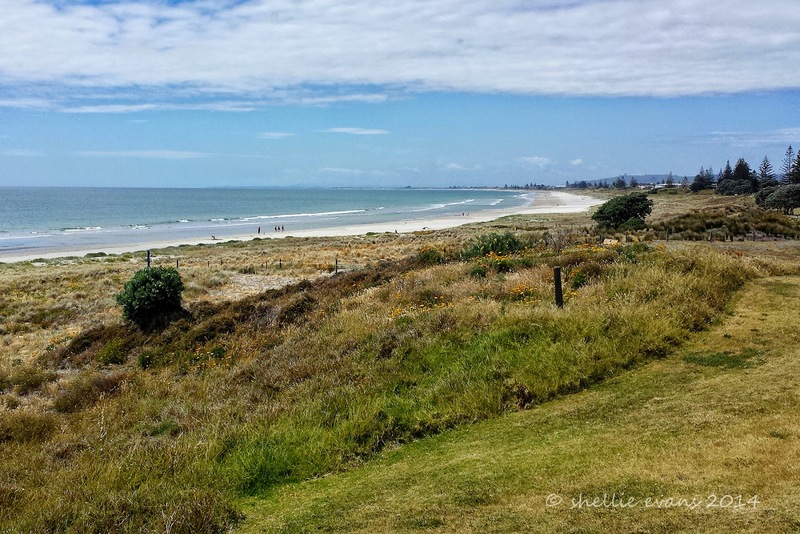 Whatamango Bay certainly looks a lot more appealing from this distance and with fine weather. We were tucked into the DOC camp around the point on the right for two nights. And the ridge the Queen Charlotte Track runs along, looks nowhere near as high as it does from the road. 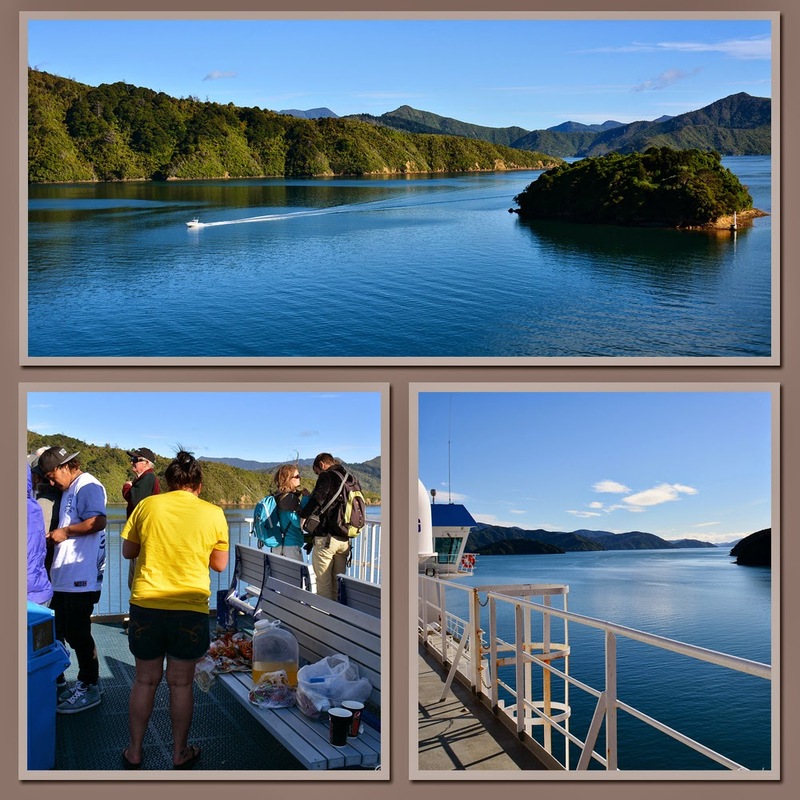 After an hour or so we turn right out of Queen Charlotte Sound through the Tory Channel and head out into a calm Cook Strait with the North Island clearly in view. Yes! Another smooth crossing ahead of us, which is pretty lucky (for me) given that there have been some big seas lately. David gets lost in conversation with the American guy again. What’s with David, boats and Americans? I wander about in the fresh air, up to the top deck and down again, from one side to the other and back inside for a short time; diesel fumes and gentle rocking are not my friends. 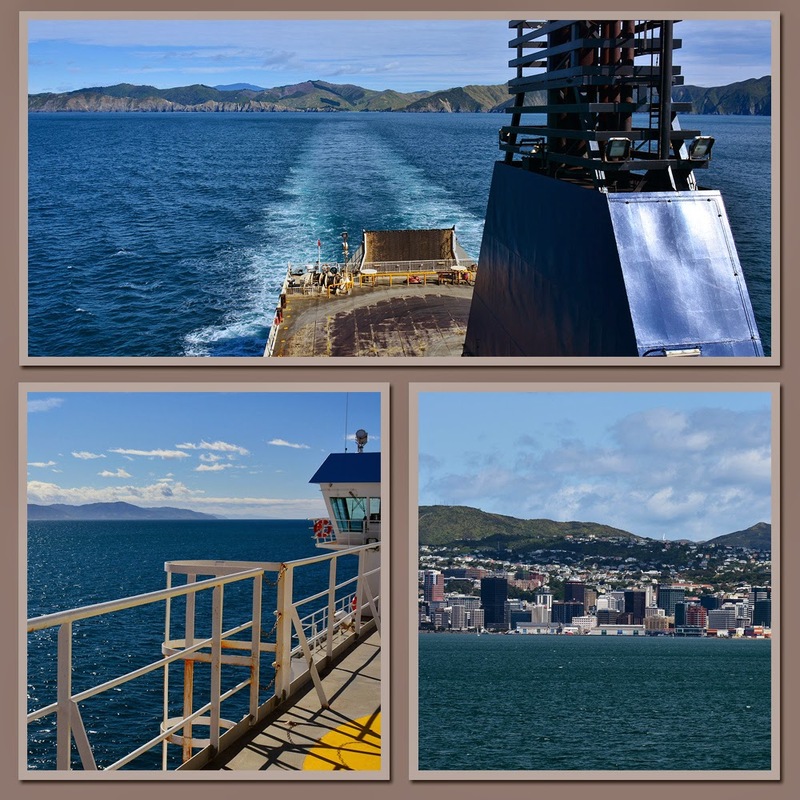 Finally we turn into Wellington Harbour and hit a stiff wind head on. No waves though. In no time at all we are offloaded and on the road heading through the middle of Wellington city on a busy Sunday morning; there’s a market on in the carpark near Te Papa museum and every car in creation is picking up or dropping off people in the slow lane and then pulling out into the middle lane without looking; our lane as it happens. Finally we weave through them all and head off up the hill and around the corner, and without any warning (that we saw), straight into Victoria Tunnel which was not what we were expecting. 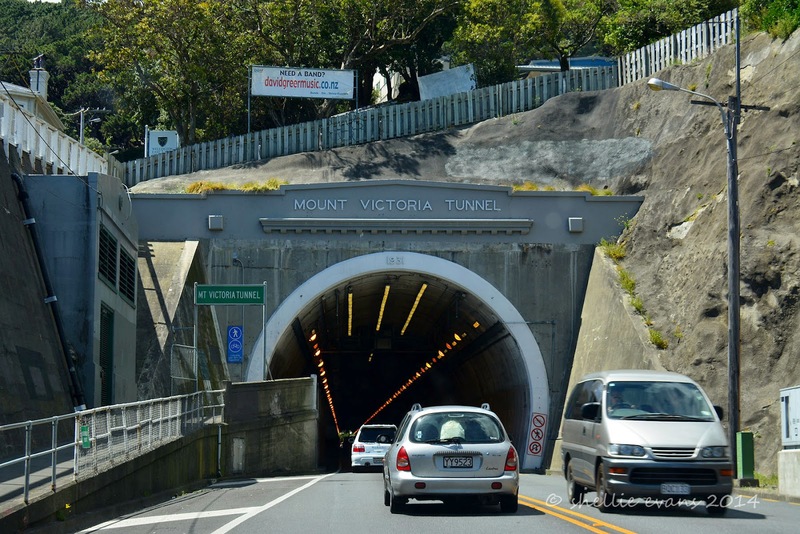 I had visions of the Homer Tunnel and the stories of motorhomes that have clipped the sides or got stuck inside but this is a much larger tunnel and used to having larger vehicles passing through it. Of course we were fine but it still gave me a bit of a fright to have it suddenly appear in front of us. We were staying in Wellington overnight so we could catch up with David’s youngest daughter Liz who we haven’t seen in 15 months and who usually lives in Melbourne. She is heading back there in the new year so we were thrilled to be able to stop off and and have some time with her before heading north. And where to stay in Wellington? Well Evans Bay of course! 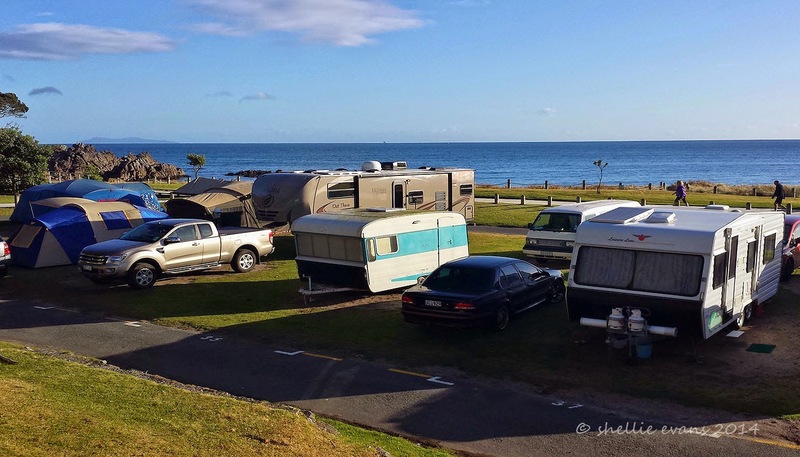 The large carpark at the end of Evans Bay Marina is now a designated freedom camping area, it was only confirmed a week or so ago through the NZMCA- although when I googled it today, I found an article saying that a final decision would be made in December. Hmm…perhaps we jumped the gun a little. This is an ideal area for camping as it’s very handy to the ferries and downtown. 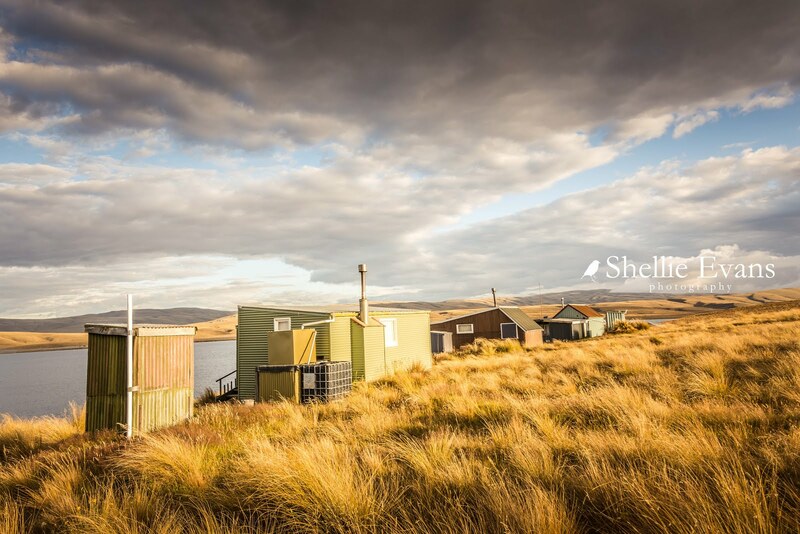 There were no signs stating the new designation and in fact a sign on the boat shed wall still said ‘No Camping’, but we re-checked the notification and we were in the right area so we pulled in. 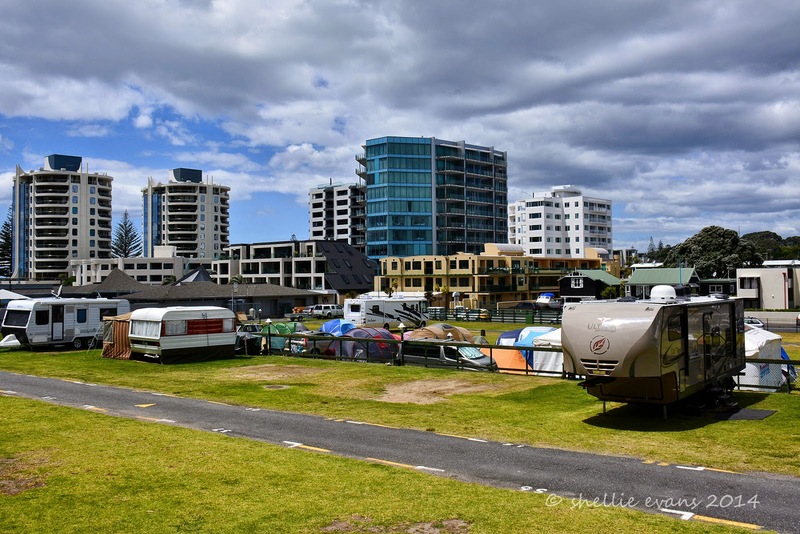 At first we lined up alongside the water with a great view over the marina but then realised that, that section was shaded red on the freedom camping notification. There was also a constant stream of people walking and cycling past our front door and up the path on the bank. We had to wait for some cars to move before we could shift, they were parked along the wall beside the grass bank. The carpark looks to be used by the locals to teach kids to ride their bikes, two or three families arrived during the afternoon with pushbikes, kids and dogs. And then two different lots of people on motorbikes learning to ride them as well. Finally they all left and we pulled in along the wall, the container behind us has something about selling Xmas trees on it. It was with a bit of consternation we learn from Liz that the ‘wind wand’ sculpture used to be behind the blue cloth & scaffolding. It got blown to smithereens by lightening during a wild storm back in August. Now that would have been interesting if we'd been parked up when that happened. We had a lovely afternoon and evening with Liz, it was good to catch up and have a few laughs. It was also a bit surreal sitting in our home having dinner near a busy Wellington intersection and with the airport close by, planes taking off and landing, along with dozens of passing Wellingtonians out walking or cycling enjoying a warm spring evening. Oh to be back in the wops…. I thought the traffic noise might have been an issue but we both had a reasonably good night’s sleep. We waited for rush hour to pass before we pulled out, we had a clear run through the city and on up the coast, the weather overcast & showery and a little windy. 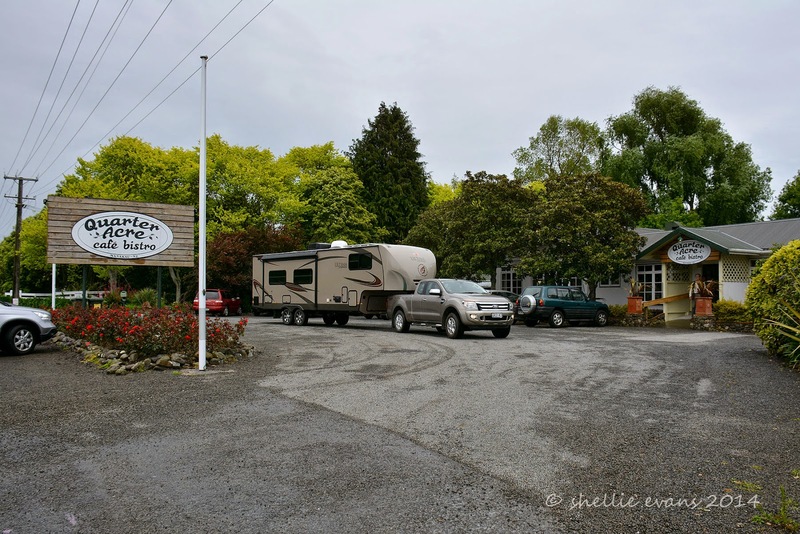 We stopped for lunch at the Quarter Acre Cafe in Manakau and I thought I’d give it a plug here. What a great spot to stop for a break; morning or afternoon tea, breakfast, lunch or dinner. It’s quite a large place with an outdoor garden area for sunny days or warm rooms inside. 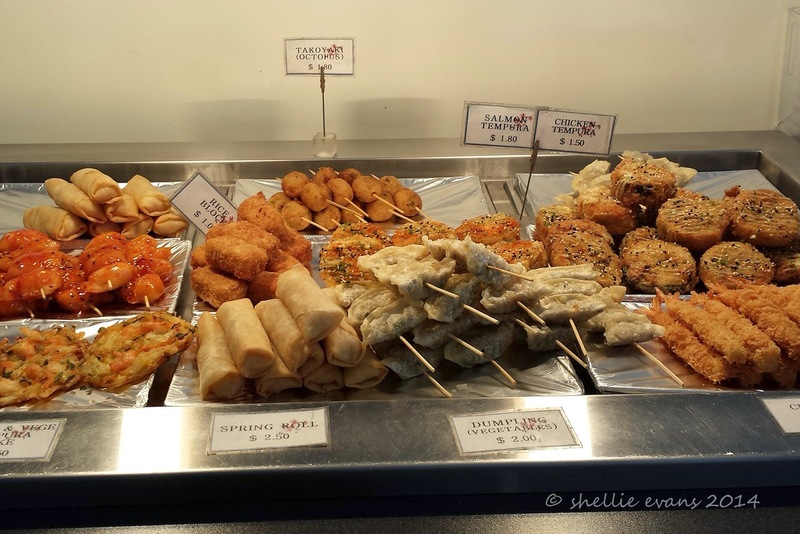 The staff extremely friendly & cheerful, the food superb and very reasonably priced too. Well worth a visit if you need a break on your travels. Tonight we are parked up at the NZMCA Park in Marton along with quite a number of others. Initially we backed in near the large green tree at the back of the site but quickly moved when I discovered we couldn't get TV because the satellite dish was blocked by the tree. Luckily I’ve learnt to check before we set up. Most of the time. 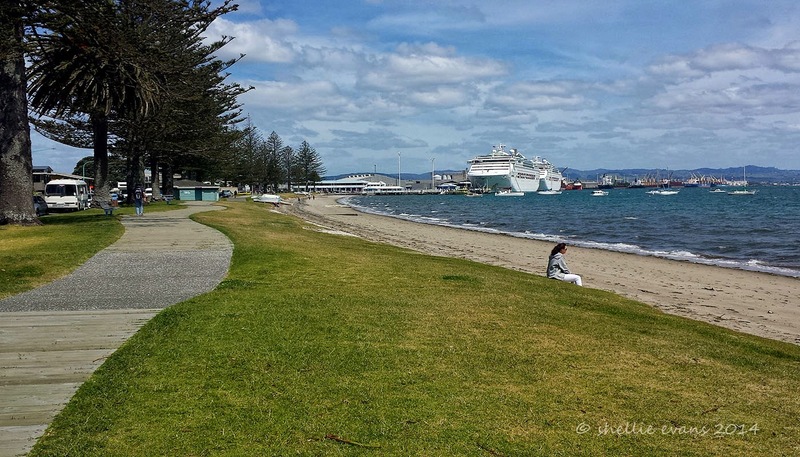 This is obviously a popular park and well positioned for members who are moving up and down the North Island. 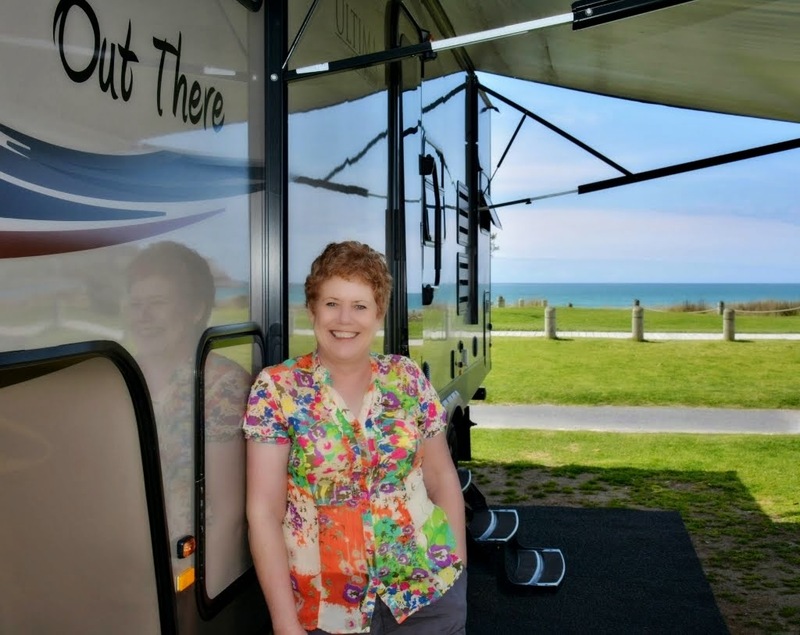 The old Marton camping ground was purchased by NZMCA who have, with the help of local members, re-fenced, landscaped, renovated some buildings and removed others from the property. It now provides a safe and secure space for members to stay on their travels and all for the princely sum of $3 pp per night. It’s also located beside a large park and gardens and just a short distance from town. It Swims Like A Duck, It Quacks Like A Duck…..